Your eyes are on the forecast. Depending on what it says, you’ll either approve or scowl. You don’t want your plans ruined but here’s the thing: you know that weather changes and you can’t do anything about it anyhow. So read the new book “Never Curse the Rain” by Jerry Apps, and learn to appreciate what comes from the skies. 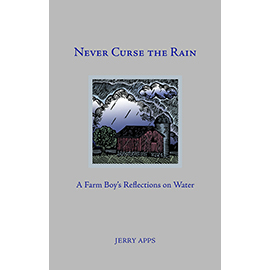 Growing up on a farm in north central Wisconsin , Jerry Apps remembers the importance of water. One of his first memories of the liquid, in fact, was when his little brother was sick: there was an emergency rite performed and, because he was standing nearby, four-year-old Apps was conveniently baptized, too. There were times when rain didn’t come. Apps remembers when the windmill didn’t turn and the cows bawled their thirst. His father first hauled water from a neighbor’s farm; when that wasn’t enough, he purchased a second-hand gas-powered pump that, with “wheezing and kabooming,” saved the livestock until the wind and rains returned. Theirs was an otherwise good well, 180 feet down and dug by hand in the late 1800s. The family was lucky; Apps says he knew of farmers who had to relocate their homesteads when wells went bad. As for indoors, Apps recalls how he and his brothers hauled water from an outdoor pump for indoor use. Saturday was bath day and Monday was wash day, which meant multiple trips with heavy pails. Other days, they carried water for cooking, drinking, and washing-up. Apps says he was grown and gone before his parents had indoor plumbing in the house; the barn had it first. But water wasn’t important just on the farm. Apps writes of fishing in local lakes, of visiting the water-powered mill, camping in the rain, after-chores swimming on hot summer days, and the blessed relief of a night-time thunderstorm. For the average reader, this book is like the literary version of comfort-food: put it in your hands, and you’ll feel as though you’re wrapped in Grandma’s hand-knitted afghan while sipping tomato soup on a grey day. Author Jerry Apps will do that to you; he’s a consummate storyteller who can sadden you on one page, tickle your funny bone two pages later, and astound you with facts in between. His memories evoke a time many readers have only learned about in books. For those who share the memories, this book is like a handshake from a friend. There are, therefore, two distinct audiences for “Never Curse the Rain”: 16-to-35-year-old readers, and anyone who’s 36-to-104. If you fit inside those basic groups, the forecast for this book is sunny.